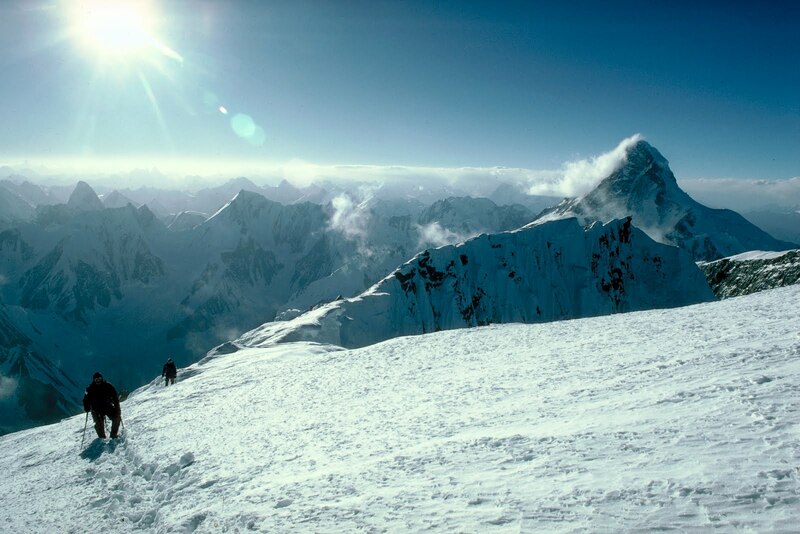 The first ascent of Broad Peak was made on June 9, 1957 by Fritz Wintersteller, Marcus Schmuck, Kurt Diemberger, and Hermann Buhl of an Austrian expedition led by Marcus Schmuck. A first attempt by the team was made on May 29 where Fritz Wintersteller and Kurt Diemberger reached the forepeak (8,030 m). This was also accomplished without the aid of supplemental oxygen or high altitude porters and without base camp support. On the same expedition, Marcus Schmuck and Fritz Wintersteller made a flash first ascent of Skil Brum peak (7,360 m) on June 19, 1957 in pure Alpine style in 53 hours. Hermann Buhl fell to his death when he and Diemberger attempted to climb nearby Chogolisa peak (7,654 m) on June 27, 1957. The summit of Broad Peak has been descended on skis. In July 2007 an Austrian mountaineering team climbed Broad Peak with the aim of retrieving the corpse of Markus Kronthaler, who had died on the mountain one year before, from over 8,000 metres. In the winter and summer of 2009 there were no summits. There was one winter expedition by a Polish-Canadian team. In the summer there was one fatality, Cristina Castagna. 1954 First attempt by Dr. Karl Herligkoffer of Germany on the SW side that failed due to a storm and extreme cold. 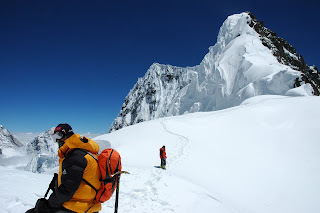 1994 On July 9, Carlos Carsolio got the summit establishing a new solo route, now known as Route Carsolio. 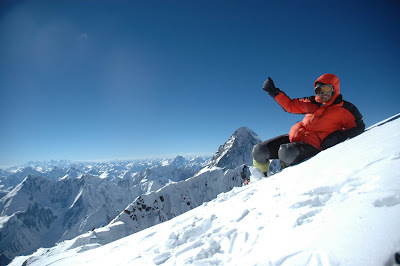 The summit of Broad Peak would be the ninth of his career-high of eight-thousanders.